A Syrian couple could not believe their luck after being blessed with not one, but six babies after trying, and failing, to conceive for a decade. 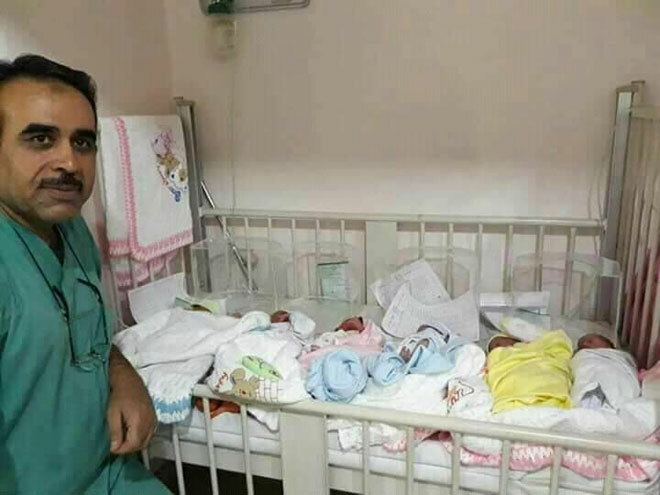 The new mama, who is in her thirties, gave birth to the sextuplets in Damascus this week, making her and her husband’s parenthood dream come true. The happy couple welcomed two boys and four girls into the world. The new additions to the family are Samer, Ahmad, Aya, Shahd, Alaa and Winam. Mohammad Alloush, father of the sextuplets, told SANA news agency that he and his wife spent ten years trying for a baby. Their final attempt at IVF was successful, blessing them with more babies than they could have ever dreamed of. And with a new big family to support, Alloush, naturally, has some concerns. “We have a limited income and were forced to leave our home. We hope to get the support we need to raise our children in the way they deserve,” the concerned father said. Luckily for the new parents, the Ministry of Social Affairs and Labor told SANA that a specialized charity will be helping them out with their newborns’ expenses.